This is a bundle of 10 sets of clips cards for numbers 1-20. 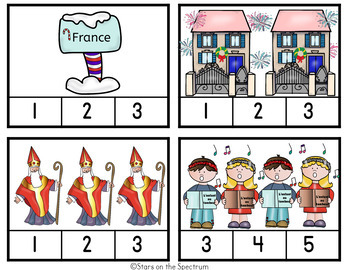 There are 10 countries represented and each set has 1-20 objects to count! Kids love these because first off. who doesn't love clip cards? Additionally, the objects to count are all things kids love! Santa, food, other kids, gifts and more. 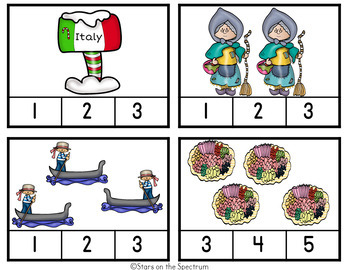 These clip cards are perfect to use to provide your Christmas Around the World studies with a math connection. 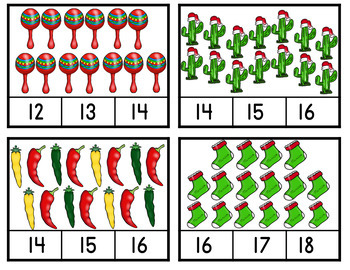 You can set up a math center and use each set as you introduce the country or set up a math center for the month of December and switch the cards/countries every few days. The Around The World clip cards are also great for individual or partner practice and a great task for early finishers.